More than ever before, people are moving to cities in hopes of finding economic opportunity for themselves and their families. More than 60 percent of the projected increase in the global urban population will take place in the Asia-Pacific region. With over one billion city-dwellers in the Asia-Pacific region already, building adaptive capacity and decreasing vulnerability to climate change in urban areas is increasingly important – particularly in many secondary Asian cities, which are burdened by an ever-increasing population and where citizens lack access to basic infrastructure. While the challenges are considerable, much progress can be achieved by aligning the goals of urban planning and development with those of climate change adaptation and resilience building. 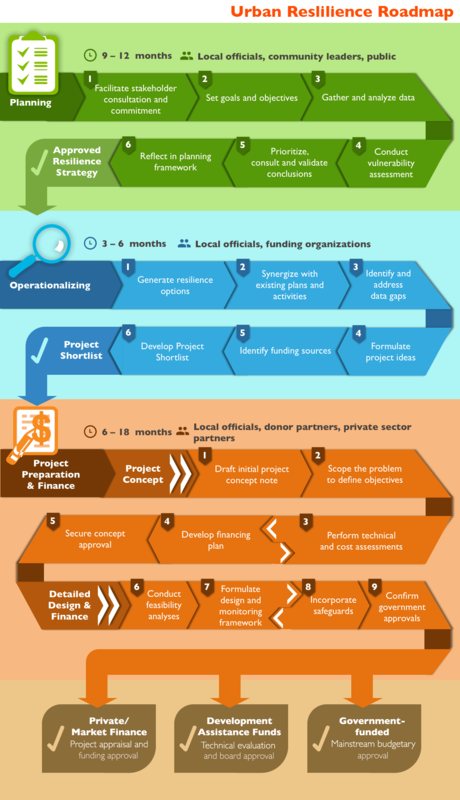 This clickable process map has been developed by USAID Adapt Asia-Pacific as a tool to help cities, government agencies, and development partners better navigate a course for building resilience, starting from strategy development and resulting in project implementation. It takes users through the different steps involved in the planning, operationalization, project preparation and financing of a resilience strategy. For each step, this includes the competencies and skills required, useful tools and resources, tips, details of supporting entities and processes, and potential outputs. For cities and government agencies, the Resilience Planning and Project Finance Process can serve as a roadmap, helping city stakeholders identify key milestones in the resilience building processes while providing a framework for organizing their efforts. For development partners, the process map can be used to better coordinate efforts by reducing redundancies in programming and focusing resources on the aspects of the process where they have the most expertise. This tool can also help cities better integrate their programs, and can serve as a coordination framework between actors, which can enhance a city’s ability to attract financing for resilience building initiatives. Building resilience requires integrated long-term planning and a forward-looking mindset. Often there is a conflict between long- and short-term interests. This process map is designed to help reconcile some of these conflicts and contribute to finding a balance by helping to bridge the gap between policy and implementation and also by connecting project design and implementation and contextualizing them in broader, longer-term efforts to enhance resilience. This is a clickable resource - click on the different stages to learn more. Based on the experience of the USAID Adapt Asia-Pacific project, as well as those of our partners, we have recognized that there are three distinct phases involved in a comprehensive approach to developing a resilience and adaptation strategy, and then implementing that strategy through projects and other initiatives. USAID Adapt Asia-Pacific (2017) Urban Resilience Roadmap. USAID Regional Development Mission for Asia: Bangkok, Thailand.